Originally there was no Superboy. Clark Kent's childhood was not discussed in any great detail in Action Comics #1, with only one panel showing the infant's strength to the amazed doctors in the orphanage. 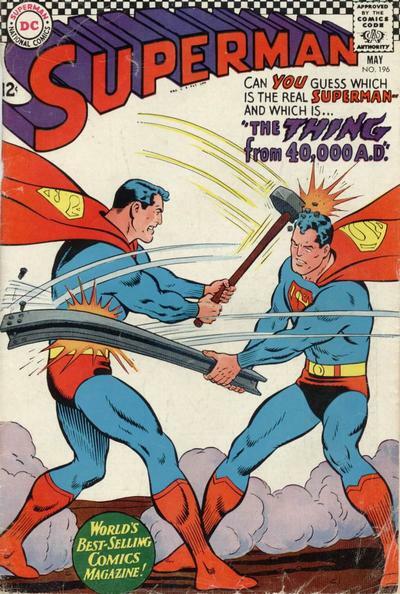 But in More Fun Comics #101, (Jan/Feb 1945), DC decided to start telling the back story of Superman as a boy. After a brief run, the series shifted over to Adventure Comics, where it settled in for over 15 years as the cover feature. A few years after that, Superboy was given his own magazine as well, which lasted even longer. 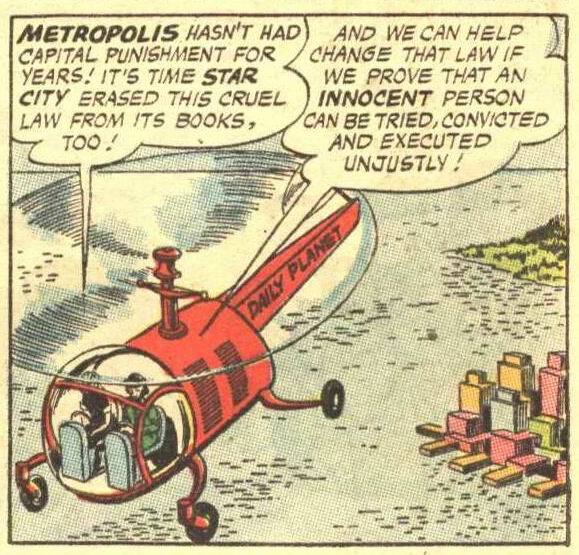 It turned out (impossibly) that Superboy had been world famous himself. Impossibly, because of course in the early Superman stories he was a man of mystery whom nobody had ever seen before. Now we were being told that schoolchildren around the world knew his name. But this was only the beginning of the tangled knot. 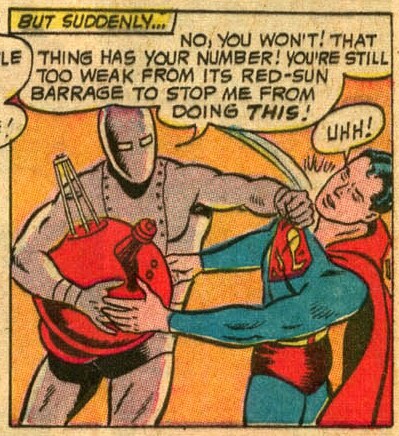 Over the years, DC had developed many familiar situations for Superman. For example, he would often be faced with the problem of appearing as Superman and Clark Kent at the same time. In the late 1950s, obviously inspired by science fiction of the time, he invented robots that could take either of his places. Naturally there was a tendency to backdate this into the Superboy stories, regardless of whether it made sense, given the era in which the Superboy stories were supposedly occuring. If Superman's in 1955, then Superboy is in the early 1940s, certainly no later than 1945. Similarly, DC "grandchilded" into the Superboy stories some of his later friends and enemies. Lex Luthor was a buddy of Superboy as a teen and only turned bitter when an experiment gone awry resulted in him losing all his hair. Master Mxyzptlk popped up in Superboy #78 (Jan 1960). Both these stories of course contradicted the original appearances of those villains in Superman stories. More serious problems developed as a result of time travel. 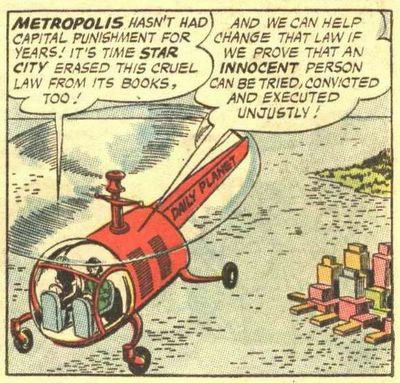 Time travel is always an interesting plot device and you will note that most of the DC heroes of the Silver Age had one method or another of traveling through time. Batman could be hypnotized by Professor Nichols, the Flash had his cosmic treadmill, the Atom his time pool, Superman could fly in circles, and for the rest of the DC crew there were the ubiquitous glass bubbles. In Adventure #247, DC introduced the Legion of Superheroes, a future group of do-gooders who invited Superboy to join them. So far so good. But later on in Action #252, they decided to create Supergirl, a young cousin of Superman who survived the explosion of Krypton. Naturally she had to join the Legion of Superheroes as well. Which meant that in the future, Superboy and Supergirl would team up. But why then had Superman acted surprised when his cousin arrived; wouldn't he have known since his teen years that Supergirl would come to this planet? The editors quickly explained that Saturn Girl placed a post-hypnotic suggestion in Superboy's mind that resulted in him forgetting about Supergirl when he was in the past. A further error was made in Adventure #253, when Robin comes back in time to save Superboy from a booby-trapped clock. He tells Superboy of his future, including his teamups with Batman. Again, these stories are wildly contradicted by earlier tales. One of the more famous deaths in the Silver Age. Ferro Lad was the creation of Jim Shooter, then a teenaged wunderkind comic writer. As a superhero, Ferro Lad wasn't much to speak of; he could turn his body into iron. This gave him great strength and near invulnerability, but that's about it. He sacrificed himself in order to transport a bomb to the heart of the Sun-Eater. Liberal Media Bias at the Daily Planet? So they pretend that Lois had killed Lana, who secretly hides out on Vulture Island while the trial is on-going, and plans to rescue her friend at the last minute by coming forward to prove she had not been killed after all. Lois is indeed sentenced to death. Of course, as is almost cliche in these stories, something goes wrong (Lana has a boating accident while returning from the island and is knocked unconscious), and it looks like Lois will actually be executed. 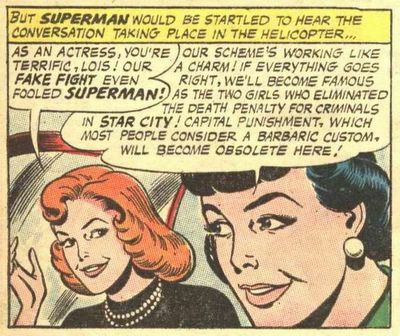 Fortunately Superman saves the day (with a little help from mermaid Lori Lemaris), and at the end, Lois and Lana celebrate as the "barbaric custom" is banned in Star City. I agree to a certain extent with both the editor and Mrs Burke on this one. 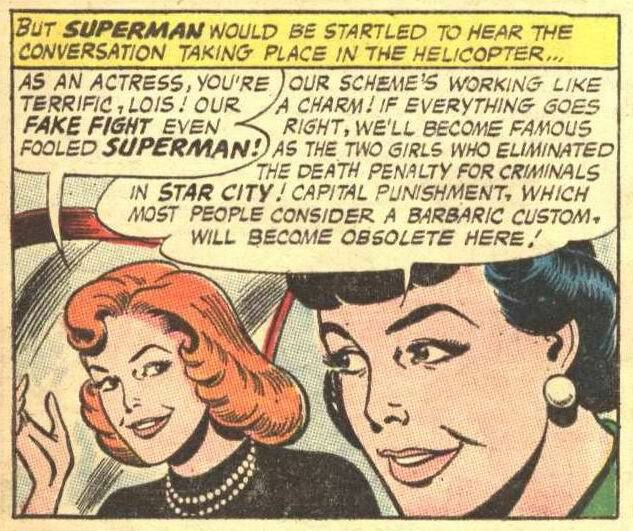 I do think Lois' opposition to the death penalty was largely just a plot device to create an interesting story. However the bit about "most people" considering capital punishment a "barbaric custom" does seem a bit over the top. Lousy poetry, lousy artwork and a monster that somehow fails to terrify. This is the absolute nadir of the Wonder Woman series. Although the Diana Rigg secret agent takeoff was a bit of a stretch, at least it has the virtue of being more interesting than this nonsense. 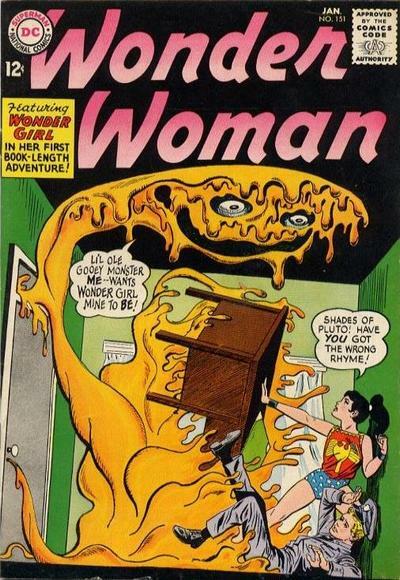 DC published 3,397 comics in the 1950s and upped that to 3,579 comics in the 1960s. Despite the reasonable similarity in overall numbers, DC published dramatically different lines of comics in the 1950s versus the 1960s. I broke the titles down into various genres: Superhero, Adventure, Science Fiction, Crime/Detective, Comedy, Western, Funny Animal, War, Horror, Teen and Romance. DC published far more Superhero books than any other genre. 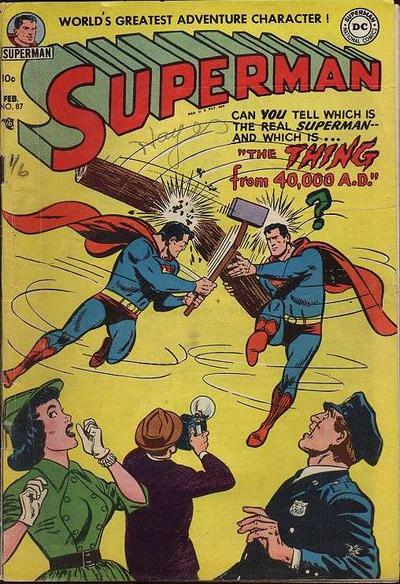 There were 849 Superhero books in the 1950s, or almost exactly a quarter of DC's total output. Following the Superhero revival of the late 1950s-early 1960s the Superhero genre exploded with 1,628 comics in the 1960s, over 45% of the total. 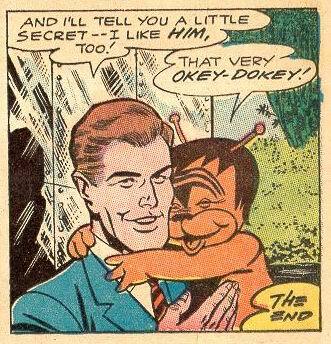 Funny Animal, which had been the second largest genre for DC in the 1950s with 533 issues, crashed all the way to 63 books in the 1960s, the lowest output of any genre for that decade. But what there was, was choice: The Fox & the Crow, a terrific series. Trivia quiz: Can you name the DC title that had one issue in the 1940s, one issue in the 1960s, and was published for the entire decade of the 1950s? Answer at end of post. 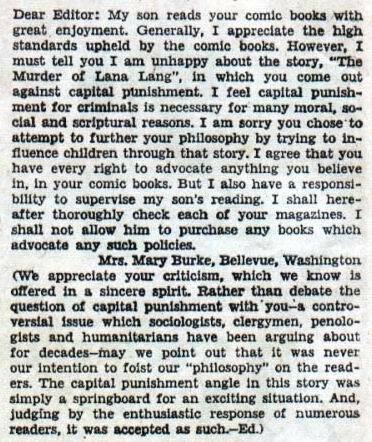 Crime/Detective was zeroed out after accounting for 172 comics in the 1950s (Gangbusters, Big Town, Mr District Attorney). Western also had a precipitous fall, from 297 issues in the 1950s to 89 in the 1960s (with most of those coming from Tomahawk). Genres showing improvement in the 1960s included Romance (243 comics in the 1950s to 460 in the 1960s) & War (379-477). However, War titles were on the decline after 1965, dropping from 56 that year to 31 issues in 1969. Science fiction was nominally unchanged, with 167 issues in the 1950s and 169 in the following decade. But by the end of the 1960s Mystery in Space had been cancelled and the two Sci-Fi mags published by DC were dedicated to reprints. Comedy was also on tottering legs. The long-running DC titles in the 1960s were Jerry Lewis and Bob Hope, two film stars who had reached the end of those phases of their careers. Hope's comic was jettisoned in 1968, and Lewis would follow a few years later. Teen titles, which had never been a big part of DC's lineup as that market was dominated by Archie, declined by 50%. Trivia Answer: Peter Porkchops' first issue was dated Nov/Dec 1949, and his last issue was Oct/Dec 1960. 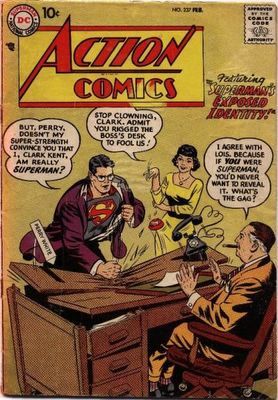 I'd sure like to be the guy selling desks to the Daily Planet; looks like Perry White's desks alone could put the kids through college. Batman versus the Outsider (Detective #328, #334, #336, #340, #349 and #356). Batman is menaced by a new foe who seems to know all his secrets. Zatanna's Search for Her Father (Hawkman #4, Detective #336, Atom #19, Green Lantern #42, Detective #355, Justice League of America #51. Zatara, who debuted in Action #1 along with Superman, has disappeared and his daughter is trying to find him. Over the course of about 2-1/2 years Zatanna would show up in one magazine or another chasing down a clue to her dad. Finally she enlists the aid of the entire JLA. Following the opposite path was Dr. Light (JLA #12, Atom #8, Green Lantern #33, Flash #171, possibly other stories?). He originally battled the JLA, then lowered his sights a little and decided to pick off the individual members rather than the entire group. Here are a couple panels from a rather bizarre story in Action #289. Supergirl decides to play cupid for Superman in this story, but each time she sets Superman up with a gal, something goes wrong. Finally she confesses, and Superman lets us know where Krypton stands on cousins marrying. Note: You can always click on a picture here to see a larger version. We all know what kind of super-feats she has in mind. 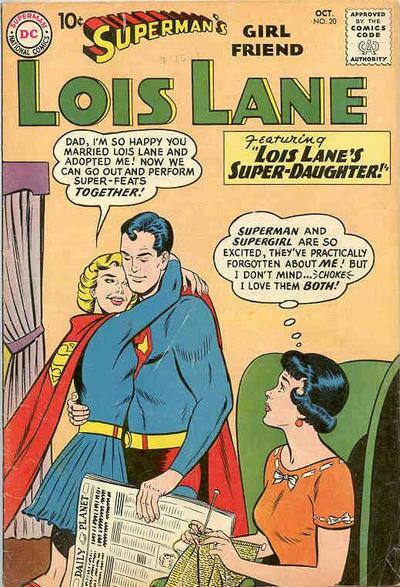 And yes, Lois, it certainly looks like Superman's excited, and covering it up with the Daily Planet. This is one of the sillier covers out there. Note that Wonder Woman's comment does not add anything to our understanding of the story. 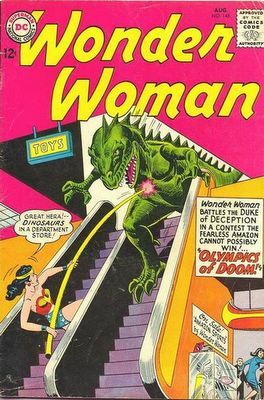 She could almost add, "And he's going down the up escalator!" In Part I of my post on J'onn J'onzz, the Martian Manhunter, I discussed some of his early exploits and powers. In this post I'll focus in on some key Detective issues in his history. First, obviously, is Detective #225, where MM makes his first appearance, discussed extensively in the prior post. In Detective #246 we are given our first introduction to lovely redhead (later blonde) Diane Meade. She is a trainee police officer but also the daughter of the Police Comissioner. As a trainee she makes Detective Jones miserable, since she's always asking questions about his methods, and he can't reveal he's using his Martian powers. At the end of the case, Jones muses to himself about the sparkle he noted in Diane's eyes when she looked at him. A pretty interesting ending to the story, eh? Remember, this is about 1957, a period when race relations were a major issue. Although J'onn is not black, he is "colored", and he certainly has some black-appearing features. I may be reading a little too much into that--sometimes a Martian is just a Martian. In the early adventures, J'onn J'onzz mostly worked in his human identity, changing only to a Martian appearance while invisible. However, in Detective #273 he was forced to reveal his Martian identity, when a criminal from Mars kayos him with a gas that prevents him from using his Martian powers anymore while invisible. Since he must be visible to fight the Martian crook he appears in public in his Martian costume. Note: In all probability this sudden restriction on J'onzz's powers was necessitated by his upcoming admission as a charter member of the Justice League of America. Detective #273 came out in November of 1959; the JLA's first adventure was in Brave & Bold #28, Feb-Mar 1960. Since the stories in the JLA would be focused on the characters as superheroes it was necessary for the Martian Manhunter to come out of the closet. In Detective #275, Diane Meade finally returned. This time she was portrayed very similarly to Lois Lane, eternally suspicious about whether John Jones was secretly the Martian Manhunter. She appears in #282 as "The Girl with the Martian Powers" and in #284 as attempting "The Courtship of J'onn Jonzz". After that she becomes more or less a regular, appearing frequently, if not in every story. In Detective #301, two significant events happened. First, Detective dropped the third feature story, expanding the size of the Martian Manhunter story from 7 pages to 12. And second, J'onn J'onzz returned to Mars for the first time. This may also have been partially caused by his exploits in the Justice League of America, which regularly traveled to distant planets; it was becoming a little hard to believe that J'onzz could not make it back to Mars with the help of his JLA buddy Superman. A major change in the feature came with Detective #311, which introduced J'onzz's other dimensional buddy Zook. Zook had some wild powers of his own, including the ability to change his temperature from freezing cold to boiling hot, and to change his shape at will. He could also read minds with his antennae. Although able to talk he was portrayed as having the mind and affectionate nature of a small child. As the picture above hints, Zook was something of a cloying, saccharine character. Although similar to the pets that many DC heroes had at one point or another, there was really nothing quite like him. 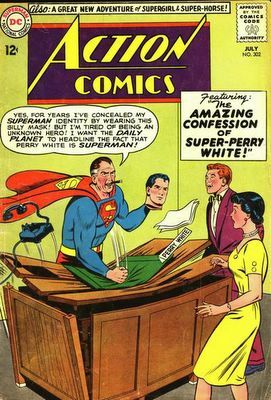 Detective #326, the last issue to feature the Martian Manhunter, introduced the Idol Head of Diabolu, a transparent plot device that guaranteed continuing stories. The idea was that once opened, the Idol Head would release an evil upon the world every full moon. This of course guaranteed monthly adventures for the Martian Manhunter, who would have them in a new location as the lead feature in House of Mystery, starting with that comic's issue #143. In addition, that issue saw the apparent death of John Jones, thus cutting him loose from the detective job.